BANGI, 30 Oct, 2012 – Exploration of planet Mars has begun with efforts underway to make it habitable to man to enable its colonisation by the end of the century. American astronaut Dr Daniel T. Barry, a member of the US Space Commission which decided to go ahead with the Mars project, said the future of mankind lies with the red planet. 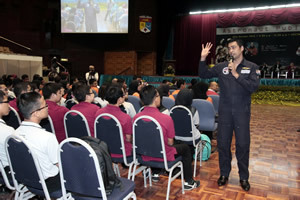 Speaking after delivering his public lecture with Malaysian astronaut Datuk Dr Sheikh Muszaphar Shukor Al-Masrie at The National University of Malaysia (UKM) today, Dr Barry said going to Mars is something we have to do. It takes six months to travel to Mars. The public lecture and workshop was organised by UKM’s Institute of Space Science (ANGKASA) and the Malaysian Industry Government Group for High Technology (MIGHT) in conjunction with the Second Inter Sessional Meeting of The Global Science and Innovation Advisory Council (GSIAC). The GSIAC is chaired by Prime Minister Datuk Seri Najib Tun Razak. Dr Barry, a Medical Doctor with an Engineering Doctorate, said it has already been proven that Mars has water and quite likely supported life once, so it can be made liveable again. It can even be turned into a colony independent of Earth and be the starting point of further explorations of the Solar System. From Mars we should be able to explore asteroids in the outer reaches of our Solar System. The Moon is too close to earth to be used as a launching-pad to more distant planets. The Moon cannot support life in the same way Mars can. Mars, he said, will be more than just a refuge as eventually it will become the home of future generations of humans. During his lecture, Dr Barry spoke of his experiences as a veteran of three space fights, four spacewalks and two trips to the International Space Station. 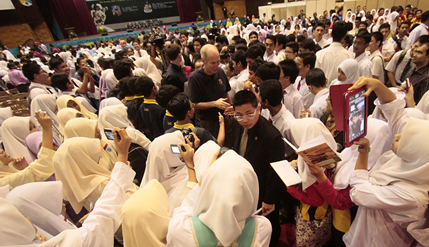 He recounted his experience of seeing the Malay Peninsula in space for the first time, which he described as beautiful. Dr Barry, born in 1953, said it has always been his dream after seeing American astronauts launched into orbit and do the space walk in the 1960s to be an astronaut. He consistantly applied to America’s National Aeronautical and Space Agency (NASA) to become an astronaut for 14 years but was rejected at least seven times. Along the way, Dr Barry graduated from Princeton University and became a postdoctoral fellow at the National Science Foundation in physics at Princeton. He then attended the University of Miami Medical School, graduating in 1982. He completed an internship and a Physical Medicine and Rehabilitation residency at the University of Michigan in 1985. He was appointed as an assistant professor in the Department of Physical Medicine and Rehabilitation at the University of Michigan that same year. Selected by NASA in 1992, Dr Barry reported to the Johnson Space Center that same year. He completed one year of training and qualified for assignment as a mission specialist on Space Shuttle flights. 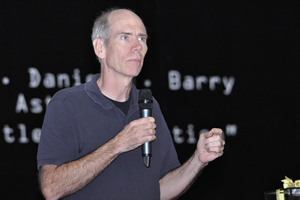 Dr Barry is also well-known for teaching youngsters to be able to write software within hours of teaching them. The workshop which Dr Barry conducted with his son Andrew taught youths to use computer programmes to control scale-model helicopters. He is currently the President and Founder of Denbar Robotics, a company rendering services in robotics, engineering, healthcare services and operations in extreme environments and was involved in numerous initiatives to promote interest in science in many countries, especially amongst the younger generation.